Write names on tags of these baubles to mark people's places at a christmas dinner party. 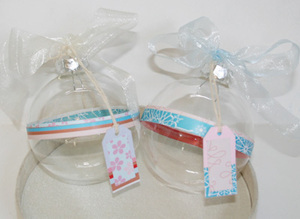 Cut strips of patterned paper and adhere around circumference of bauble (thinner strips work best. Punch a hole in top of tag, thread with string and attach to top of bauble. Thread a length of ribbon through top of bauble and tie into a bow. Don't forget the Fiskateer online party this weekend - there is lots of fun to be had. Check out the details here. shape with gold and/ or silver paint. comfort grip craft knife or micro tip scissors. shapes. Put the shapes back together. Break off a section of your garland and wrap it around your shape to secure it. 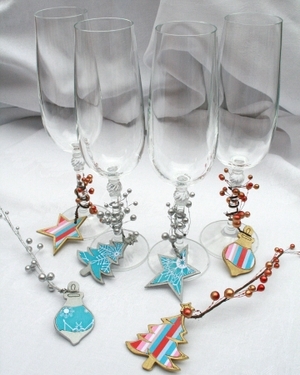 Wrap around the stem of the glasses. 1. Select a symmetrical shape for your decoration and cut out 5 – 8. 2. Fold each in half from top to bottom with the pattern on the inside. 3. Glue the first half of the shapes back to back, with the folds stacking on top of each other. 4. 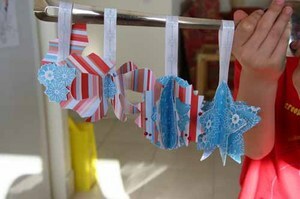 Fold an 18cm length of ribbon in half and attach that to the folded shapes. 5. Continue adding shapes until they are all glued together, then open them out into a circle and glue the first and last shape together. THIS PROJECT WAS CREATED TO HOUSE FAVOURITE FAMILY RECIPES THAT GET USED YEAR AFTER YEAR, WITH THE THOUGHT THAT NEW ONES CAN BE ADDED EACH YEAR AND THEY CAN THEN BE PASSED ON DOWN TO THE KIDS. Cut Bazzill Basics white to A4 size so it fits through printer and print out 4 of your family favourite recipes one on each sheet and cut so that each recipe is centered into a 14cm x 14cm square. Cut 2 cards to measure 9.5cm x 6cm, leave one blank and on the other print out the following to be centred. A family recipe that you all hold dear. 3. Run the 6 pieces of printed and cut white bazzill through the xyron sticker machine and adhere to the precut chipboard to form recipe cards and saying card. 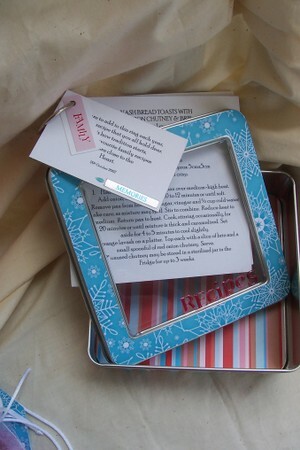 Note: that 1 side of the saying card will be blank whilst the recipe cards will have a recipe on each side. 4. Punch tag out of white bazzill and adhere "family" sticker and trim ends as shown, punch a hole in this also. 5. Adhere "memories" metal word and rain dot splat to saying card. 6. Using the largest eyelet setter punch holes in the left hand corner of each card as shown. It will feel very thick but keep emptying the punch and it will cut through neatly. Also punch hole in the tag as well. 8. Out of striped paper cut a 16cm x 16cm square. The strip that goes around the bottom outside of the tin with vertical stripes is 4cms wide by approx 62cms around. You will have to join a couple of strips for this piece. Out of the blue snowflake paper cut a 15.5cm x 15.5 cm square, out of this in the centre cut a square that is 12.7 cms x 12.7 cm and round the corners outside with the corner rounder and inside with the craft knife ( this will be the piece for your lid). When you have all the pieces cut , run them through the xyron machine and then adhere to the tin as shown. 9. To finish project adhere alpha rain dots onto the lid in the bottom right hand corner to read "recipes " and join all the cards together with a clip ring. You heard right the first time "Fiskateers"
So what or who are the Fiskateers? Well that would be telling wouldn't it. But I'll just tempt you buy saying they're fun, fabulous and oh so friendly. Want to know more? Just click on the blinkie and you'll be on your way. So why should you join? 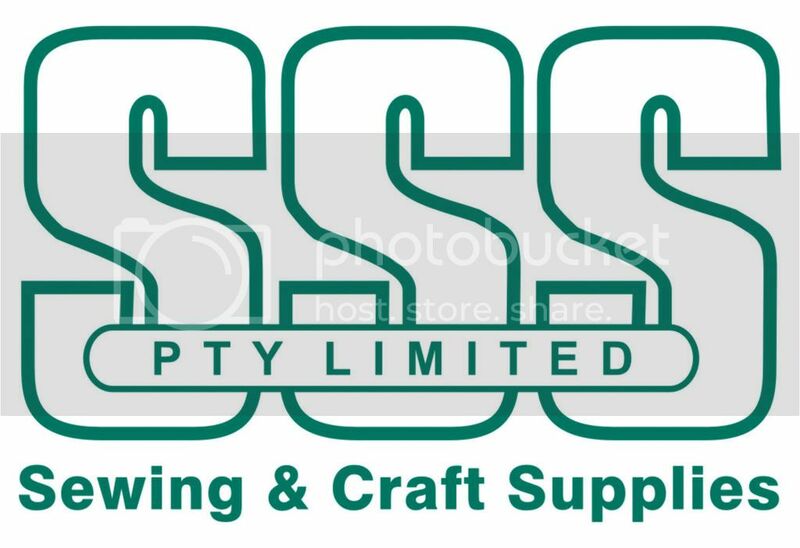 It's such a great resource for crafters, they're a very supportive community of like-minded people and you could have heaps of fun. So what are you waiting for? Why not send May, Stephenie, Cheryl or Holly an email - they'll have you on your way in no time to becoming a fully fledged Fiskateer. What could be a better time to join? May is hosting an online party next weekend, full of fun, challenges, projects, RAK's and prizes. So what have you got to lose? Don't leave it until the last minute or you'll be disappointed. More details about the online party can be found here. Paint each button shape with paint. Using FISKARS 12” trimmer cut cardstock 6” x 12”, then using the scoring blade score at 3” from each end. Onto piece of velum print your invitation message. Then trim to 5 ¾ “ x 5 ¾ “. Cut piece of paper to 6” x 6” and stick inside the invitation, then stick the velum piece on top. Cut a piece of ribbon long enough to go all the way around the card, and stick onto the back only. Wrap around to the front and tie in a bow. Break off a couple of wire bead pieces from your garland and tie between the holes in your MDF buttons then stick onto the front of your card. only 14 sleeps to go! I'm hosting an Aussie Fiskateer Christmas PARTY at my place in Yarra Junction on Monday December 10th.....more details are on the Fiskateer website! You can click on the link on the lefthand sidebar to take you to the Fiskateer website! More details to come over the next few days.....so stay tuned! * Fiskars squeese punch Large round'nround. Cut a piece of glamour bazzill 14cm x 28cm and fold in half to form square card. Layer onto this a sparkle bazzill card measuring 12.5cm x 12.5cm and onto this a white bazzill card measuring 12cm x 12cm square. Punch out 4 hearts from bazzill white and 4 hearts from Heidi Grace stripes mount the stripes onto the cardstock and adhere to the front of card on magic mount tape to give dimension. Lastly add a length of rick rack to bottom of card as shown. Cut 9 squares measuring 3cm x 3cm and adhere to the front of card as shown. Punch out 6 May Flowers from white bazzill and stick 2 together and finish with a rain drop in the middle. Add to the 3 middle squares on the front of the card. 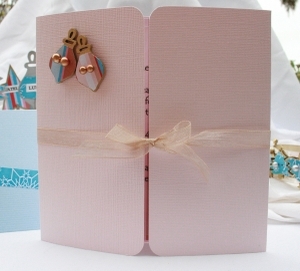 Cut a card out of pale pink bazzill measuring 18cm x 13cm and fold in half to form a card. Cut strips of paper and adhere to the front of card as shown, blue snowflakes 4.5cms wide, stripes 1cm wide, white just under 1cm wide. Use alpha rain dots to spell "joy" and mount on a scrap of white and then glamour bazzill and attach to front of card as shown with a piece of pink ricrak. Cut a card out of white bazzill measuring 18cm x 13cm and fold in half to form a card. Onto this layer a piece of teal bazzill 12cm x 8cm and onto this layer stripes 11.5cm x 7.5cm. Wrap a piece of ribbon around the top and knot onto the front. Punch a white bazzill tag and punch a hole out of the top and adhere to this a sparkle bazzill large round'n round circle. Punch a medium round'n round circle out of the blue snowflakes and put on top. Tie tag onto ribbon and adhere to card with magic mount. Cut a piece of white bazzill measuring 21cm x 15cm and fold in half to form a card. Cut a star out of shape template using stripe paper and adhere to front of card as shown. Spell the word "Christmas" onto a strip of white bzzill and mount onto a piece of pale pink bazzill leaving a small border and then onto a piece of glamour bazzill again leaving a small border. Adhere to the front of the card using magic mount towards the bottom of the card. 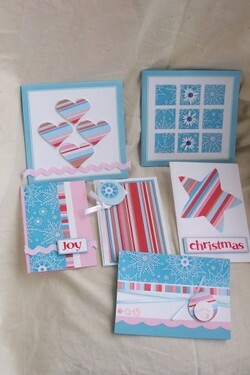 Cut a piece of teal card measuring 21cm x 15cm and fold in half to form a card. 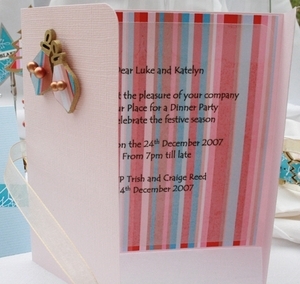 Using the scallop template cut a piece of pink card 15cm long and trim to approx 1cm width. Onto the front of the card from the top down adhere a piece of blue snowflake paper 4cm x 15cm, then a piece of white bazzill 4.5cm x 15cm and then the pink scallop uner this as shown. Cut a strip of Heidi Grace stripes approx 1 cm wide and 15 cms long and attach to the top of white leaving a little border. Embellish with a double wrapping of ribbon, 3 little peony flowers on the left and circle embellishments with 25 in raindrops on top. Mount onto card with magic mount. Thankyou to everyone that left a comment and shared their ideas on gifts for the teachers. I loved reading all the different ideas and hopefully you've all helped out some others who were totally stuck on what to give this Christmas. If you haven't yet seen all the great ideas shared, please check out the comments left on the original thread here. As promised a lovely pack of Brittany's Castle papers, ribbons & rub-ons will be winging it's way out to one lucky person who left a comment and shared their ideas. For this I enlisted the help of a random number generator and the generator spat out comment number 25..
Congratulations to Melanie - I really loved your idea of the mini books for the teachers, especially getting the kids to write a little note each too :) If you could email me your details, I'll get your RAK off to you straight away.